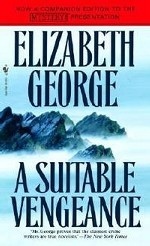 Аннотация к книге "A Suitable Vengeance"
Award-winning author Elizabeth George gives us an early glimpse into the lives of Detective Inspector Thomas Lynley, forensic scientist Simon Allcourt-St. James, and Lady Helen Clyde in a superlative mystery that is also a fascinating inquiry into the crimes of the heart. Lynley, the eighth earl of Asherton, has brought to Howenstow, his family home, the young woman he has asked to be his bride. But the savage murder of a local journalist is the catalyst for a lethal series of events that shatters the calm of a picturesque Cornwall village and embroils Lynley and St. James in a case far outside their jurisdiction — and a little too close to home. When a second death follows closely on the heels of the first, Lynley finds he can`t help taking the investigation personally — because the evidence points to a killer within his own family.